1. 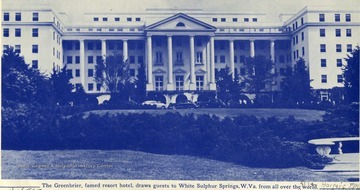 Greenbrier Hotel, White Sulphur Springs, W. Va.
2. 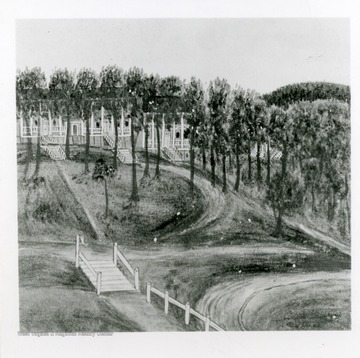 Greenbrier (Old White) White Sulphur Springs, Lewisburg, W. Va.
Greenbrier (Old White) White Sulphur Springs, Lewisburg, W. Va.
An ink etching of the Greenbrier (Old White Sulphur Springs) in Lewisburg, West Virginia as it appeared in 1858. Men and women are shown mingling in the front lawn of the Greenbrier while a horse drawn carriage driver is dropping off several people. 3. 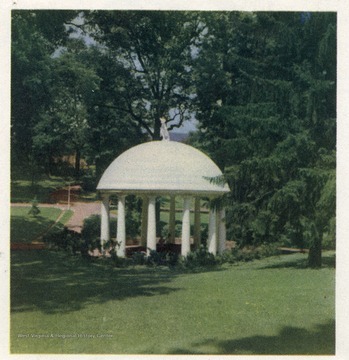 Rotunda on the Grounds of the Greenbrier Hotel, White Sulphur Springs, W. Va.
Rotunda on the Grounds of the Greenbrier Hotel, White Sulphur Springs, W. Va.
4. North Portico of the Greenbrier Hotel, White Sulphur Springs, W. Va.
North Portico of the Greenbrier Hotel, White Sulphur Springs, W. Va.
5. 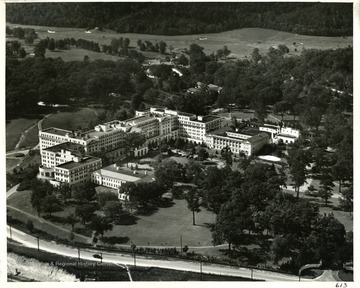 Aerial View of Greenbrier Hotel, White Sulphur Springs, W. Va.
6. 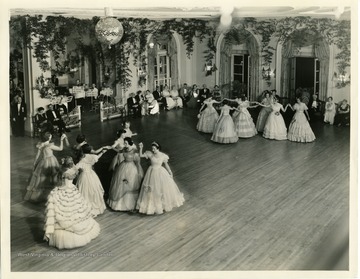 Lee Monument Ball at the Greenbrier Hotel, White Sulphur Springs, W. Va.
7. 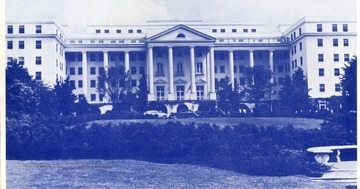 Greenbrier Hotel, White Sulphur Springs, W. Va. 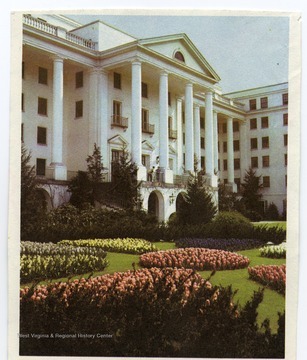 The front of the Greenbrier Hotel in White Sulphur Springs, West Virginia. 8. 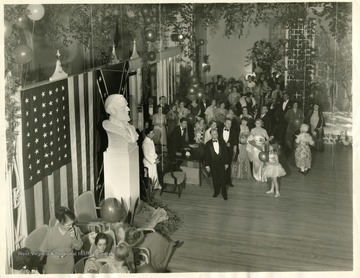 Unveiling of the Bust of General Lee at the Greenbrier Hotel, White Sulphur Springs, W. Va.
9. 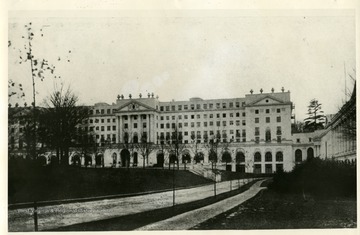 Greenbrier Hotel, White Sulphur Springs, W. Va.
10. 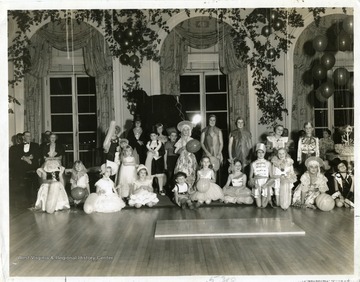 Annual Children's Fancy Dress Ball, Greenbrier Hotel, White Sulphur Springs, W. Va. Annual Children's Fancy Dress Ball, Greenbrier Hotel, White Sulphur Springs, W. Va.
A group photo of children who participated in the Annual Children's Fancy Dress Ball at the Greenbrier in White Sulphur Springs, West Virginia. 11. 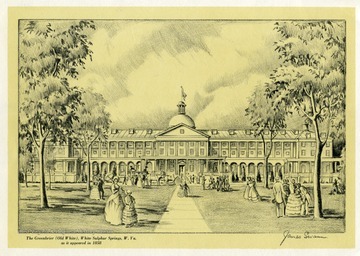 Sketch of Greenbrier Hotel, White Sulphur Springs, W. Va. Sketch of Greenbrier Hotel, White Sulphur Springs, W. Va.
12. 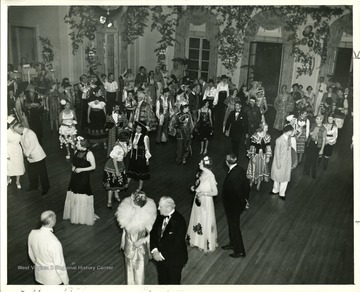 Old White Fancy Dress Ball, Greenbrier Hotel, White Sulphur Springs, W. Va.
Old White Fancy Dress Ball, Greenbrier Hotel, White Sulphur Springs, W. Va.